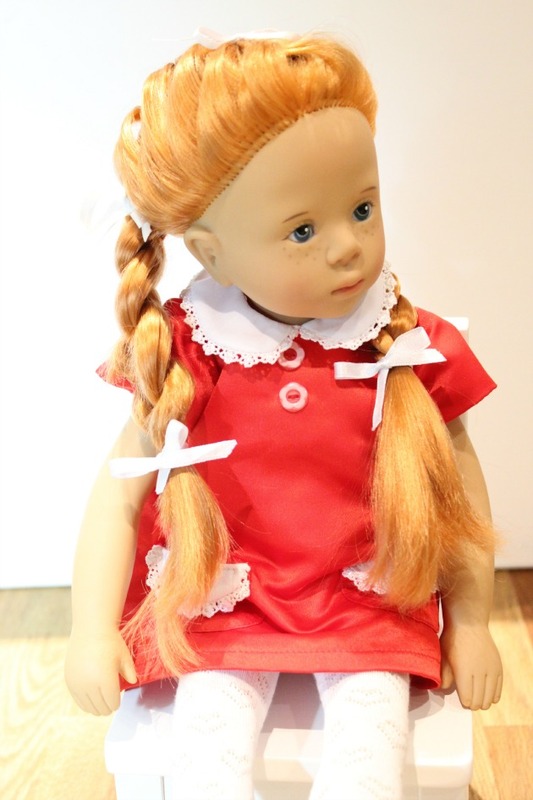 When a a doll has rooted hair she usually has an area of hair that is a bit more densely rooted and this indicates where the hair parting was when she left the workshop or factory. 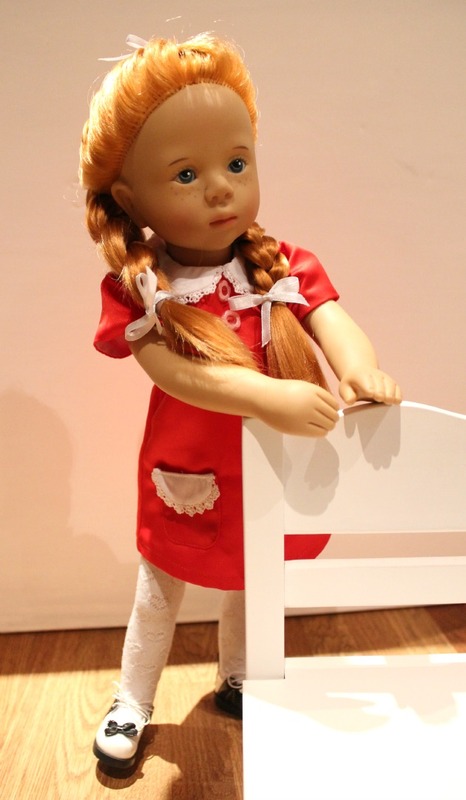 Many dolls have a half part on the side, or in the middle, where more hair was stitched to give thickness and fullness to the hair on both sides of the parting where the hair would fall either side, showing no scalp. 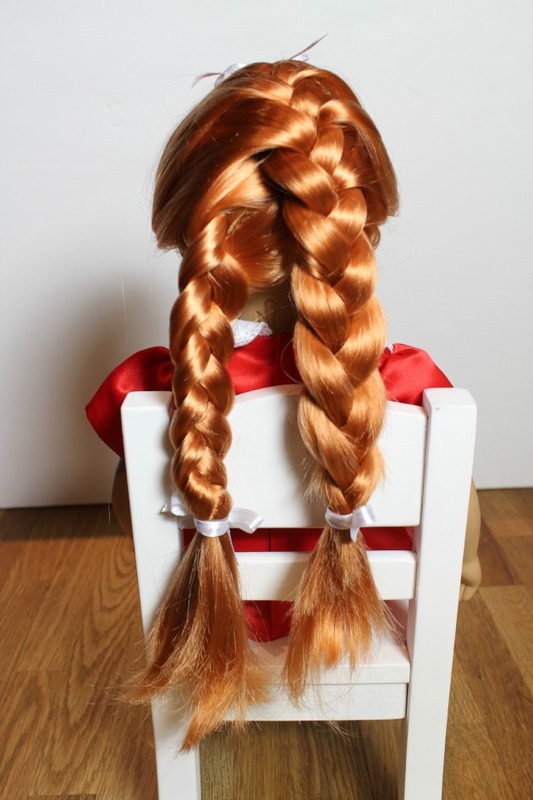 A half part means that the parting only goes to the crown of the doll’s head which works well if the hair is to be worn loose or brought together into a style like a ponytail as no scalp will show with these styles. 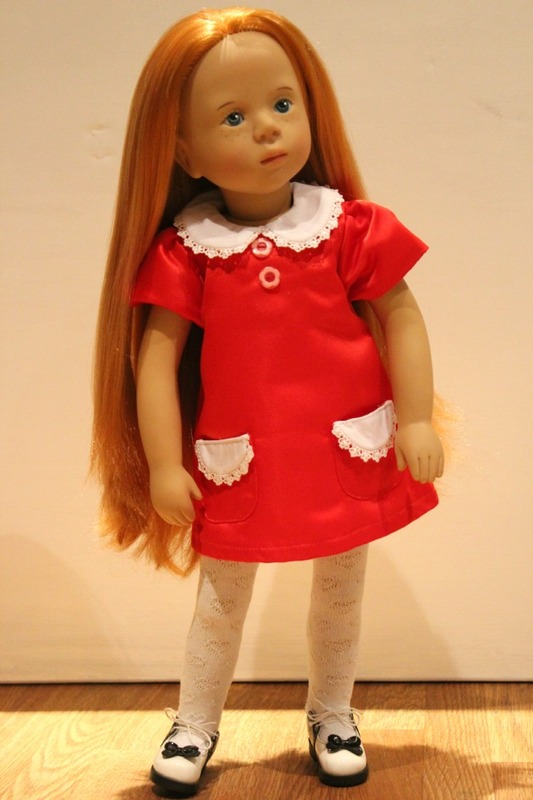 Occasionally some rooted haired dolls can be made with a full parting like Gotz 2012 Sophie. Sophie left the factory with her hair styled into two braids, there’s a photo of her further down the page. Beautiful Fanouche, made by Gotz for Sylvia Natterer in 1989 has rooted hair which when parted in the middle into two braids shows the vinyl head and the roots, however it can be braided slightly differently to achieve the same effect and yet show no scalp. Fanouche is going to demonstrate for us. 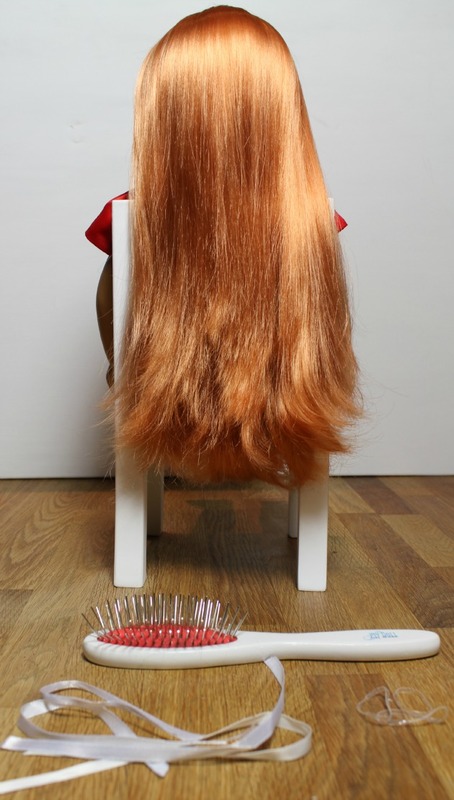 You will need 2 hair elastics, ribbons if you like and a good doll hair brush like the My Doll Best Friend Essential Doll Hairbrush which is made with metal teeth with straight pins so they cannot catch on the wigged or rooted hair and pull it out. Take hair from ear to ear, leaving loose a bit extra below in the middle, and section it off. Check that the top section of hair and the bottom section have roughly the same amount of hair in each. French braid the hair in the bottom section starting at the right ear and working around the hairline to the left side and then into a long braid, finish with a hair elastic. French braid the top section starting at the middle of the doll’s forehead and don’t braid straight but instead take it off to the right to create the second long braid. Again finish with an elastic. I then put 3 little ribbons in her hair, one at the front just looped around part of the braid and one at the end of each long braid. Fanouche doesn’t like having her hair styled; she’s tolerating it though because she’s got new shoes on that she’s very proud of! Here’s her hair from the back with the ribbons. Although my Fanouche was made in 1989 by Gotz you can see that Gotz Happy Kidz Sophie 2012 has the same colour of hair and it looks to me like the same quality too. Fanouche’s hair has been played with a lot and it’s still in great condition. I added an extra little ribbon just by her right ear in this photo. I think she can go and play now, don’t you? 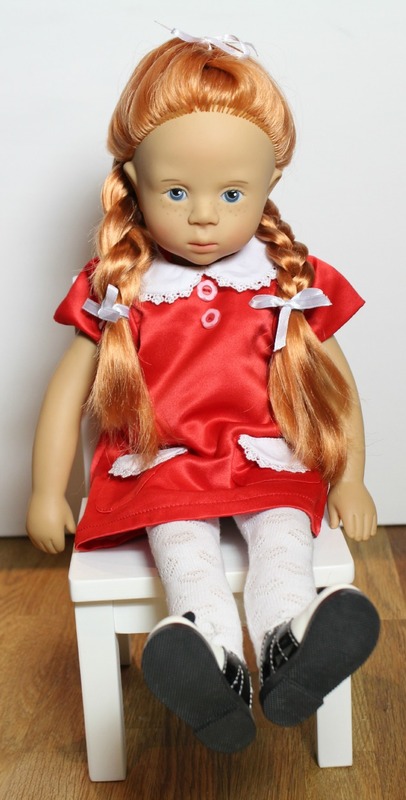 If you do this hairstyle on one of your dolls, please do send your photos in and we’ll add them to the Gallery as well as to our Facebook page; it would be wonderful to see them! 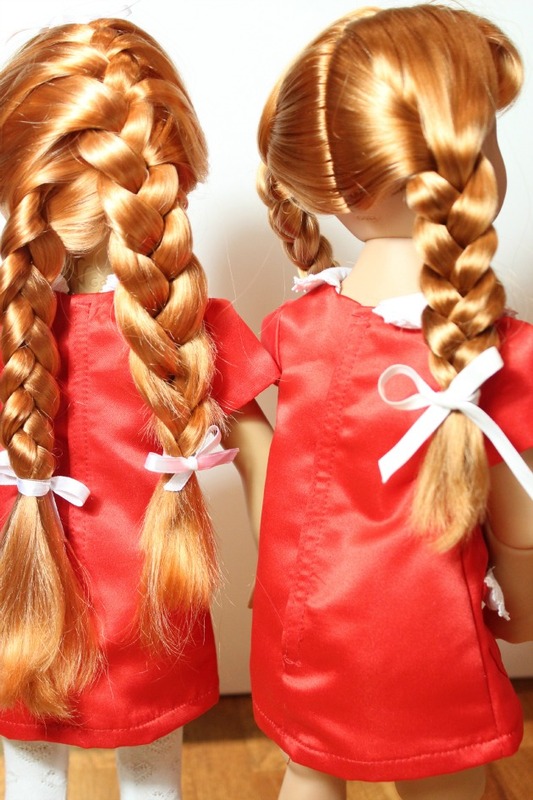 Braids can look lovely on dolls with rooted hair, you just have to know how! The Essential Doll Hairbrush and hair elastics are available in the shop. Fanouche cannot be bought new anymore as she was retired in 2006 but her outfit which will fit your Fanouche and most other 45-50cm dolls and many shorter dolls too, is available in the shop. She told me to say that the shoes are ‘the model’s own’! What a great way to get around the rooted hair issue. This would work well with Springfield dolls in the US. I love the photo of her with her hat on!